Meters below the busy streets above, a hidden concrete utopia snakes its way from the downtown core out beyond the suburbs. 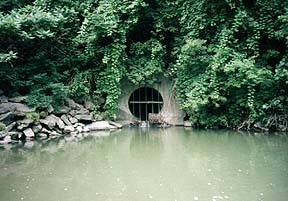 Concrete pipes conduct our urban stormwater to strange fringe areas known as forests, meadows, riverbanks and seashores  a gallery of horrors collectively known as nature. In these unholy "natural" areas, the ground is covered with neither cement nor asphalt, and rainwater is allowed to fall directly onto the ground and soak into the earth at its own pace. Ironically, these primitive wildernesses are exactly the sort of places one must visit to find the grated entrances leading to storm drains. And so, hateful though it was, I spent the latter half of my summer traipsing through plant-filled suburban forests, wandering along wooded riverbanks filled with insects, and scratching my case of poison ivy, all in order to bring you this preliminary report on the state of drains in the Toronto area. After managing to find a way to climb into the drain without swimming, we headed up until we came to a waterfall. After spending a few days in the Metro Archives reading about the Hogg's Hollow disaster, where three men were killed by flooding while building a pipe, I decided to check out the accident site, and enlisted Sean's help for my first draining expedition. After meeting up at York Mills station, Sean and I headed down into the river valley that winds under the intersection of Yonge and York Mills. Slashing our way through the trees and bushes, we followed the sound of running water until we caught sight of a big cement pipe emptying large quantities of water into the river. Journeying to the other side of the river, we scrambled down the rocks beside the drain and lowered ourselves through the widely-spaced vertical bars of the grate. Sean and I wanted to keep our shoes dry, so we had to take one step on the left side of the water, one step on the right, and so on. After we'd duckwalked a few slippery meters into the unlit 1.8m round concrete pipe, I switched on my six-D-cell Maglite, which brightened things up considerably and fulfilled certain deeper needs I do not claim to understand. I put up some stickers to officially claim the drain in the name of the Cave Clan, and resolved to bring a marker next time, as well as boots and a hat. 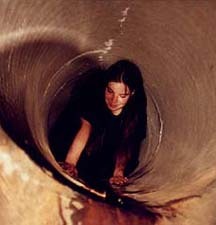 Sean and I proceeded up the pipe, eager to spend the rest of the afternoon mapping and exploring a real live drain. We were happy to escape the uncomfortably hot and sunny day in favour of a dark, cool drain. As we marched upstream, I inhaled deeply and savoured the sweet scent of wet cement. Before long, we heard the thunderous sound of rushing water up ahead. A few minutes later we found the source: an impressive four-meter waterfall pouring water down into a chamber at the end of our section of the drain. Unfortunately, that was it, end of drain, so we headed back out. We still had a lot of draining enthusiasm, though, so we spent the rest of the day following the East Don and the Don on foot in search of other drains, but we met with no further successes. 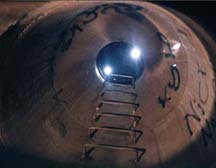 In fact, after this initial success, I went through a long dry spell in my drain quest. I spent a lot of time at the library and Metro Archives reading about drains, sewers and buried rivers, as well as seeking maps and other hot draining tips. I found a small map showing a bunch of drains that emptied into the Humber River, but Sean and I spent a hot afternoon enduring the wilds of Etobicoke only to realize that none of the drains emptying into the Humber are large enough to accommodate people. I investigated some rivers in Scarborough, but found nothing more exciting than some tiny tunnels where rivers passed underneath roads. And then, one fine day, I noticed a big chunk of cement underneath a chain-link fence winking at me right in my own suburb, and realized I didn't have to go to the big city to go draining. Neighbourhood Drain was our first successful foray into a long, suburban drain with proper ladders, manholes and multiple levels. 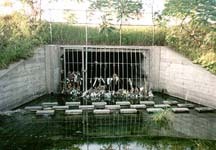 Neighbourhood Drain is named after its position adjacent to a small, stagnant pond in Pickering's Neighbourhood Park. 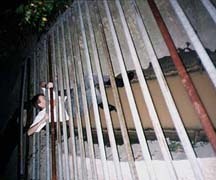 Sean and I headed down to Neighbourhood Drain one sunny summer afternoon, and very carefully squeezed our wiry bodies through the middle of the grate's vertical bars and into the water on the other side. We were still wearing just regular shoes, but Neighbourhood Drain was too full of water for us to possibly stay dry, so we just took the plunge and resigned ourselves to spending the afternoon in soggy sneakers. I resolved to bring boots next time, as well as a hat and a marker. Whereas the York Mills drain had been totally unlit, Neighbourhood Drain was a 1.8m round concrete pipe lit by sunlight pouring through holes in manhole covers spaced every 20m or so. It was in Neighborhood Drain that I first began to notice all the incredible sounds associated with draining, like the echoed splashing as we strolled through the drain water and the evil-sounding metallic thwump-thwump of cars running over the manhole covers above us. 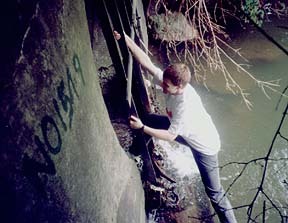 We weren't the first explorers to visit the drain, as it was filled with graffiti throughout. Sean and I climbed the metal rungs set into the walls of the drain up to some of the manhole covers and tried to push them off, but they absolutely refused to budge. We spent a very long time walking up the drain, and it seemed to stretch on forever. We probably would have started talking about calling it a day soon if we hadn't heard rushing water up ahead. Proceeding to the source of the noise, we found a very large waterfall chamber where the pipe we were in came to an end, and another pipe began two meters up. Sean and I couldn't figure out any way to climb up through the waterfall into the drain's second level, so after a bit of frustrated whimpering, we turned back, and spent most of the walk back to the grate discussing how we could get a ladder or some other climbing aid into the drain with us when we came back to conquer the rest of the drain. 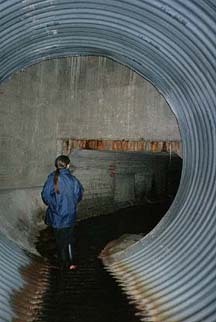 One Sunday afternoon, Persephone and I headed east to Ajax to take a look inside a rectangular drain we'd spotted. After trudging along from the car to the river in our shiny new rubber boots, we scrambled hastily down the bank to avoid getting any further strange looks. We hopped onto the cement blocks in the outfall pond, and ventured towards the grate, which was unhinged at one side and thus very easy to pry open. We waded into the unlit rectangular tunnel, which was about 4m wide and 1.5m tall. Neither of us was able to stand straight, though Persephone had far less ducking to do. As I brushed the dirt and cobwebs out of my hair, I resolved to bring a hat next time, as well as a marker. As we wandered through the tunnel, I commented that I didn't think this drain would go very far, as it didn't look like any proper drain I'd read about in Il Draino, and I figured it was just a short underground tunnel where the creek ducked beneath the highway. The dark rectangular section of the drain continued for a long time, and the water kept getting deeper and deeper until it got to a point where we had to wade through the water extremely slowly to avoid making waves and filling our boots with water. It was very uncomfortable walking while doubled over, so we were glad when we eventually found a dry spot where we could stop and sit down for a bit. Shortly after we resumed our travel upstream, we reached a junction room. Ahead of us lay two round tunnels. The one on the left was a fair bit larger, so we started there. We walked along for a fair while, peering down every little side tunnel. We had no idea where we were in relation to the world above. After a fairly long while of wandering, we came across a small waterfall where another large round tunnel emptied into our current tunnel, which I climbed up and investigated briefly. The new tunnel seemed to go on for quite a while, but Persephone wasn't comfortable climbing up and it was too small to be really inviting. We continued to travel up the main tunnel for a while longer, but eventually the monotony started getting to us, so we headed back. We voyaged back to the big junction room and ventured up the smaller of the two main tunnels. The water was a distinctly reddish-brown colour that we attributed to rust. As we went farther we noticed the water take on a chemical smell  we would've turned back if not for the tempting sound of rushing water ahead. 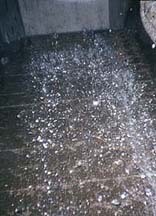 Unfortunately, both the smell and the sound were explained by a large, steady stream of water pouring down from the roof just ahead  someone was emptying their pool. Since our path was blocked (and my neck was very sore), we decided to call it a day. On the way back, I noticed a fish swimming in the water, indicating that the water wasn't completely poisonous, but we decided to hold out a little longer and get something tastier to drink once topside. We emerged from the Great Ajax Drain more than two hours after we'd started, and I really don't think we saw half of it. An acquaintance of mine unenthusiastically described another fairly lame little drain he knew of in northern Pickering, so I recruited Sean and Persephone to come along with me and check it out one night. We quickly located the creek associated with the drain, and headed down into the creekbed to investigate the cement tunnel which ran beneath Dixie Road. We determined that the water was safely below the tops of our rubber boots, so we began to wade upstream into the rectangular tunnel. After a short stroll through fairly deep water, we came to an intersection with a slide ahead, a dead-end drain to the left, and an uncomfortably small oval tunnel leading off to the right. We wandered down the oval tunnel for a while, noting the sandy bottom and the large schools of small fish frantically swimming about. The real highlight came when we encountered Mr. Crab: a surprisingly large crustacean who scurried away in a panic when we tried to get him to pose for a photo shoot. Mr. Crab's Lair changed from an oval into a 1.4m round concrete pipe, and seemed to continue on for quite some distance, but a proper exploration simply would have required far more crouching than we were able to give. Our brief visit to Mr. Crab's Lair was too brief to be satisfying, so we drove off to the northwest to check out some grates I had previously spotted in northern Scarborough. Exiting Persephone's car, the three of us wandered the banks of the East Don, meticulously investigating each block of concrete we spotted. Unfortunately for us, it seemed that the Scarberians were rather uptight about defending the virtue of their drains. We found several different grates, but they were all tightly padlocked shut. 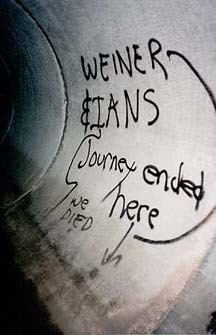 After pushing our way into Pipe Dream and wading upstream for about half an hour, we encounted some graffiti left by a past ill-fated expedition. We wandered up the East Don armed with determination and a burning desire to get inside at least one more drain before we gave up and called it a night. Eventually, our persistence paid off when we spotted a huge hunk of concrete at the bottom of the riverbank. We scurried down the overgrown banks of the river in our rubber boots, and when we saw the mighty drain at the bottom, cursed our luck. It was tightly padlocked shut with four padlocks. 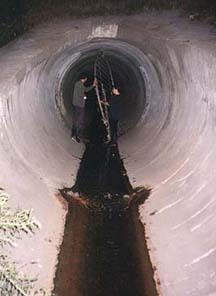 The drain and its grate were much larger than any we'd seen previously  perhaps 2.4m in diameter. As the three of us idly mused about how fantastic it would be to explore a drain that big, Sean and Persephone wandered up and grabbed hold of the grate in order to peer through the bars, and were surprised to notice that the grate gave a little. They pushed on the grate and were amazed when it swiveled open wide enough to let us through! After a brief pause for a commemorative photograph, we eagerly dashed into the drain, sliding the huge grate shut behind us. The abundance of graffiti along the walls of the drain's first 20 meters made it clear that several other exploring parties had previously toured the massive drain, and a fresh set of wet paw prints indicated that something else had wandered through the grate fairly recently. These tracks  presumably left by a confused raccoon  went a long way in before disappearing. We saw more graffiti further along marking where past explorers had given up. I resolved to bring a marker next time, as well as a hat. When we passed under our first manhole, it became clear that we were travelling about two storeys underground. After a long while of wandering up the drain, we began to suspect that this drain was huge in more ways than one, and since it was already getting fairly late, we decided to travel upstream at a forced march for the next half hour in the hope of finding something interesting. We quick-stepped up the drain for a half an hour, but failed to find anything thrilling within our self-imposed time limit, so we began the march back. Most people probably have some trouble understanding the appeal of spending the night marching up and down a dark, wet cement tube  at least until they try it for themselves. I can't say for sure, but I suspect draining offers many of the same mind-expanding benefits as being in a sensory depravation tank. There are many things to sense in a drain, of course, like the wonderful smell, the steady, echoed slap-splash of explorers marching through the water in unison, and the sight of uniform concrete tubes stretching towards infinity in either direction. At one point Persephone asked Sean if he thought the drain was getting smaller, and he replied that either the drain was getting smaller or we were getting bigger. In such an unnatural environment, there was really no way for us to determine which was true, as there was nothing "real" we could look at to restore our natural sense of proportion. With nothing real to correct my mental processes, it was a simple mental trick for me to imagine that gravity had shifted and that we were walking on the ceiling, or marching straight down the pipe towards the centre of the earth. We amused ourselves in other ways, too, like turning off the flashlights and marching in absolute darkness for long stretches. During one such spell of darkness, I jogged a long way ahead and then suddenly turned on the Maglite and sprinted back towards Sean and Persephone in my best imitation of a subway train. We attempted a sing-along for a bit ("drainin', drainin', drainin', keep that water drainin'..."), but found the ambient noise to be preferable. When we eventually emerged from the drain back out into the outside world, it looked hyper real. It all seemed unnaturally large, and filled with far too many non-drain colours and non-drain noises. The ground felt much too dry, and we all remarked that it felt awkward walking on such flat ground without an echoey splashing sound to reward us each time we raised or lowered our feet. We were eager to return to the much cozier atmosphere offered by drains. Somewhere along the line, our draining expeditions dislodged some of Sean's very painful, deeply suppressed childhood memories, and he recalled he had once travelled up a drain located in a forest valley in his hometown of Markham. As best he could recall, the drain was short and uninteresting, but he offered to try to take Persephone and I on a tour, if he could find it again. 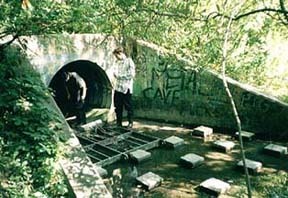 After a long stroll through the meadows and forests of Markham, the three of us spotted a small creek spilling out of a well-decorated concrete structure labelled Metal Cave. 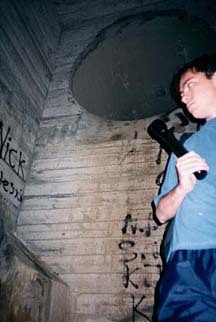 Past explorers had succeeded in completely detaching the grate from the entrance, so we hopped right in. Metal Cave began as a long, trapezoid-shaped tunnel, with thick steel walls and ceilings and a concrete floor. At the end of the metal cave proper, we came to a very tall concrete chamber where a waterfall poured down several storeys and the drain seemed to come to an end, aside from some ladders leading four storeys up to the surface. Taking the ladder up three storeys, we discovered a second section of Metal Cave that continued along for some distance, one storey underground. This second section of Metal Cave is a constantly twisting and turning 1.4m round concrete pipe, with not much to see beyond some amusing graffiti and some stalactites. 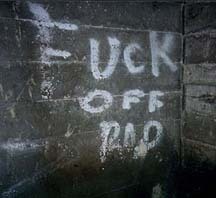 Up three flights of ladders in the second section of Metal Cave, one finds some entertaining graffiti. Metal Cave was cramped and filled with small, disgusting stalactites, which I occasionally bumped into, filling my hair with rusty mush of unknown origin. I resolved to bring a hat and a marker next time. In spite of such obstacles, it was tempting to continue further and further up Metal Cave, because we had a suspicion that this drain's Really Cool Thing would turn up just a few meters beyond the point where we gave up. The sad fact is that drains often don't end well. They go on forever, or they just get really small. Very rarely is there a big checkered flag and a trophy waiting for you at the end. And the rooms full of naked women are really few and far between. The reward really has to be in the doing, rather than in the completion. Both Limbo's entrance and its small side tunnels require some bodily contortion. Aside from asking everyone I knew if they knew where I could find some nice drains, the most productive tactic for finding new drains seemed to be driving along riverbanks while keeping an eye out for the promising sight of a chain link fence atop a big chunk of concrete, a sight which almost always indicates drain action below. Persephone and I discovered Limbo after an evening of such prowling. Limbo is so named not only because it is a place of lost souls, but also because of the bodily contortions its entrance requires. Only a couple of horizontal bars are missing from the gate to Limbo, and these are, unfortunately, the bars closest to the wet bottom of the drain. Limbo is definitely not a good place to get caught in a flood! Persephone and I marched up Limbo's main round tunnel for a long while, noting with appreciation that the drain had been constructed way back in 1964. As we walked, we wondered how the drain had come to be filled with large rocks, fallen electrical cables and broken bits of tree, and discussed what we'd do if we stumbled across a corpse. I figured it would depend how hungry I was. Soon enough, we came to a junction room, where as usual we elected to explore the larger of the two branches first. Neither branch was tall enough to be enjoyable, however, so once we determined that nothing very interesting awaited us down either tunnel, we headed back and out. Shortcut, a drain running under Toronto's main highway and railroad line, was filled with interesting shape changes. 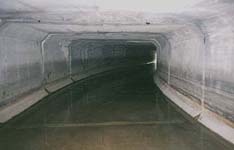 I mentioned my drainquest to another acquaintance of mine, and she told me that she didn't know much about that, but that when she was younger she and some friends had used a drain tunnel to cross under the 401 highway and railway lands that bisect Pickering. She couldn't exactly remember where the tunnel was, but armed with her vague directions, Persephone and I headed out to the intersection of Fairport and Kingston Road to search for the lost shortcut. We headed down into the valley beside the highway and quickly found two large, 2m by 2m cement tunnels where a small creek headed under the highway. 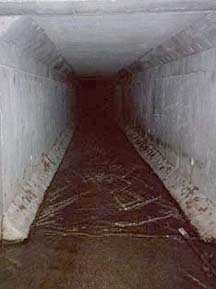 Neither tunnel had any grate whatsoever, so we turned on our flashlights and headed in. 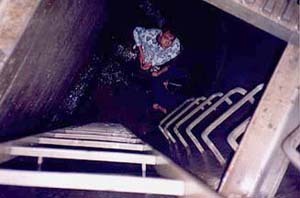 Before long, we found a series of ladders leading three storeys up to the surface. I climbed up and realized I was right underneath a square grate set into the shoulder of the 401. Persephone and I continued our underground journey for about 10 minutes before spotting light from streetlights pouring in through the drain's exit up ahead. We were disappointed at first, but then noticed that our square drain simply let out into a tiny little outdoor pond before the creek continued its course through another, much larger drain. The second half of Shortcut was even more interesting; it began as a very large metal pipe, the bottom half of which had been reinforced with concrete. The water ran through very deep and fast. Based on some of the huge rocks and tree branches we found further along, this drain must be a pretty scary place to be during a storm. We passed several side tunnels where large quantities of water poured in  most of these were grated, though we found one where the bars had been cut away. 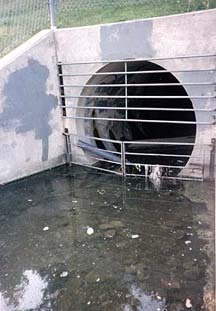 After 10 minutes or so, the concrete reinforcement at the bottom of the drain disappeared; then the metal pipe emptied out into a very tall concrete chamber before the drain resumed in the form of a rectangular concrete tunnel. With so many shape changes, I thought I'd died and gone to Melbourne. We followed this tunnel through various twists and turns for a while, until we spotted a big pond up ahead. The water poured out of our drain into a deep, wide pond somewhere in the wilds of south Pickering. Such were my first eight successes in the draining world. I haven't written much about all the heartache, but drain discovery involves a lot of research, luck and long nights. Some of my many failures included visits to small, dusty pipes under construction sites, locked drains, flooded drains, and one gorgeous but inaccessible monster of a drain  a 3.75m(!) round concrete pipe fenced in and firmly grated in Toronto's Park Drive Reservation. I'll get in, another time. This article originally appeared in Infiltration 11, together with an interview with FiL on draining down under and an article by Peter Sand about an expedition gone wrong under Minneapolis.